Boulder CO (SPX) Oct 13, 2010 ! 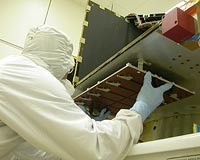 The Venetia Burney Student Dust Counter, flying aboard NASA’s New Horizons mission to Pluto, now holds the record for the most distant working dust detector ever to travel through space. On October 10, the “SDC” surpassed the previous record when it flew beyond 18 astronomical units – one unit is the distance between the Sun and the Earth – or 1.67 billion miles, past the orbit of Uranus.